Marksburg is the only medieval castle of the Middle Rhine that has never been destroyed. 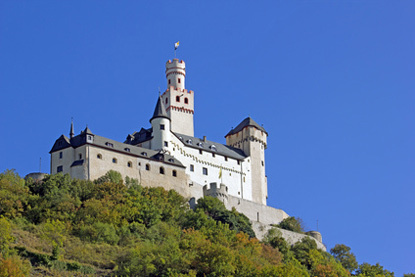 The fortress was built around 1117 above the town of Braubach and had purely defensive purposes. It is listed by the UNESCO as part of the Rhine Gorge World Heritage Sites. The castle is open all year round, daily from 10:00 am to 5:00 pm (11:00 am to 4:00 pm from 5th November to 15th March). The annual closing days are 24th and 25th December. In summer time, English guided tours are held everyday at 12:00 noon and 4:00 pm. Admission is 6 € for adults, 5 € for students, and 4 € for children.